I love the dryer. This dryer cuts down on static cling without having to put dryer sheets in with it. 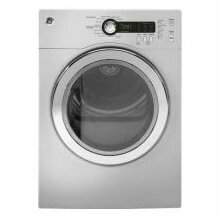 I have never had any clothing get clogged or lost in the dryer and always smell fresh and crisp. I am able to even dry some of my clothes that are specific for dry cleaning only. I will never go with any other brand than GE for washer or dryer. I love them.